Harry Koozata Ivory Bowhead Whale A handsome bowhead whale carved from fresh ivory by Savoonga artist Harry Koozata. 4 1/4 in. long x 1 3/4 in.wide 1 1/4 in. high c. 4th quarter of the 20th century Please note that products containing any ivory or other marine mammal components cannot be shipped to New York or California. As of this writing, it is still legal to ship these products to all other states. Click here to see a brochure published by the U.S. Department of the Interior with more details on this topic. If you are interested in having this product shipped outside the United States, please call 207 967-2122 to discuss permit requirements. 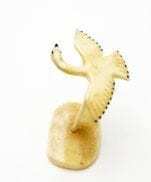 Vintage Eskimo Ivory Swan A flying swan, Delicately carved from old ivory with scrimshawed eyes and wing markings. C. 3rd quarter twentieth century 1 1/2 in. long x 2 in. wide x 3 1/4 in. high, including base. Because of ivory trading regulations, this item can not be shipped to California, New Jersey, or to any country other than the United States. Ivory Bowhead Whale Made c. 4th quarter of the 20th century, this whale was carved from an exquisitely colored piece of old walrus tusk. 5 3/8 in. long x 2 3/4 in. high 1 1/8 in. wide Please note that products containing any ivory or other marine mammal components cannot be shipped to New York or California. As of this writing, it is still legal to ship these products to all other states. Click here to see a brochure published by the U.S. Department of the Interior with more details on this topic. If you are interested in having this product shipped outside the United States, please call 207 967-2122 to discuss permit requirements. Warren Kakoona Spotted Seal This spotted seal carved from walrus tusk is both inlaid with baleen and scrimshawed to represents the many spots of a spotted seal. It is a chunky seal with no lack of blubber. Mounted on a base of "fossil" ivory. Signed Warren Kakoona, Brevig Mission, AK. Seal is 4 3/8 in. long x 2 in. wide x 1 1/4 in. high. Including the base, dimensions are 7 1/4 in. long x 3 in. wide x 2 in. high. Because of ivory trading regulations, this item can not be shipped to California, New Jersey, or any country other than the United States. Alaskan Ivory Kayak Hunter A miniature baidarka-style kayak, complete with hunter holding the line to a seal float. 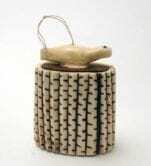 Primitive scrimshaw features. 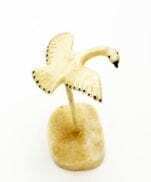 c. 3rd to 4th quarter of the 20th century 3 1/8 inches long x 1 1/4 inches high x 3/4 inch wide Please note that products containing any ivory or other marine mammal components cannot be shipped to New York, New Jersey, or California. As of this writing, it is still legal to ship these products to all other states. Click here to see a brochure published by the U.S. Department of the Interior with more details on this topic. Vintage Eskimo Ivory Seal An ivory seal, c. 3rd quarter 20th century, with inlaid baleen eyes. It's a cute one! 2 1/2 in. long x 1 5/8 in. high x 1 3/16 in. wide Please note that products containing any ivory or other marine mammal components cannot be shipped to New York or California. As of this writing, it is still legal to ship these products to all other states. Click here to see a brochure published by the U.S. Department of the Interior with more details on this topic. If you are interested in having this product shipped outside the United States, please call 207 967-2122 to discuss permit requirements. Six Ivory Seal Heads Made c. 3rd quarter of the 20th century, these six ivory seals by an unidentified artist were carved from a single piece of walrus tusk. All six seals are poking their heads out of the water at the same time. Eyes are inlaid baleen; mouths and noses are scrimshawed. 3 1/2 in. long x 2 in. wide 1 1/2 in. high Please note that products containing any ivory or other marine mammal components cannot be shipped to New York or California. As of this writing, it is still legal to ship these products to all other states. Click here to see a brochure published by the U.S. Department of the Interior with more details on this topic. If you are interested in having this product shipped outside the United States, please call 207 967-2122 to discuss permit requirements. Vintage Eskimo Ivory Seals Two ivory seals carved from walrus tusk and adorned with scrimshawed facial features. The seals are pegged to a large slab of ice (made from bone). C. 3rd quarter twentieth century; Ivory cracks are typical of carvings of this age. Seal 1 - 4 1/2 in. long x 1 3/8 in. wide x 1 1/8 in. high Seal 1 - 4 1/4 in. long x 1 1/4 in. wide x 1 in. high Base - 8 1/2 in. long x 6 in. x 1 1/4 in. high Please note that products containing any ivory or other marine mammal components cannot be shipped to New York or California. As of this writing, it is still legal to ship these products to all other states. Click here to see a brochure published by the U.S. Department of the Interior with more details on this topic. If you are interested in having this product shipped outside the United States, please call 207 967-2122 to discuss permit requirements. Archie Slwooko Ivory Walrus and Pup A charming carving of a walrus mother (heavily bearded) with her pup. Slwooko's walruses have a distinctive style, captured here not only in the adult, but in the pup. Signed A.H.S. C. 3rd - 4th quarter twentieth century 4 1/4 in. long x 2 1/4 in. wide x 1 3/8 in. high Please note that products containing any ivory or other marine mammal components cannot be shipped to New York or California. As of this writing, it is still legal to ship these products to all other states. Click here to see a brochure published by the U.S. Department of the Interior with more details on this topic. If you are interested in having this product shipped outside the United States, please call 207 967-2122 to discuss permit requirements. Antique Alaskan Eskimo Snuff Box A delightful and unusual piece dating from the late 19th or early 20th century. 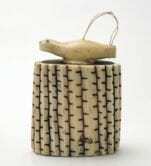 Carved from a walrus tusk and decorated to look like a fishing basket, the box has a carved seal on the wooden cover. The wooden panel on the bottom is inscribed "Simpson Coll". The box has been restored with conservatory adhesive; the loop is new as well. With few of these items on the market, this is a rare find. 3 1/4 in. high x 2 1/2 in. x 1 1/2 in. Please note that products containing any ivory or other marine mammal components cannot be shipped to New York or California. As of this writing, it is still legal to ship these products to all other states. Click here to see a brochure published by the U.S. Department of the Interior with more details on this topic. If you are interested in having this product shipped outside the United States, please call 207 967-2122 to discuss permit requirements.